Petals 5, white, usually with fine red veins; flowers single, ¾–1½” across [2–4 cm]; 10 stamens; leaves ternate, resembling clover but bigger, the leaflets each 1¼-2″ long [3–5 cm] and heart-shaped (point inward, indentation outward), folding down at night or in bright sun or hard rain; stems and leafstalks rise 4–7″ [10-18 cm] from rhizomes. Habitat: Deep lower forests west of the Cascade Crest; WA, OR. 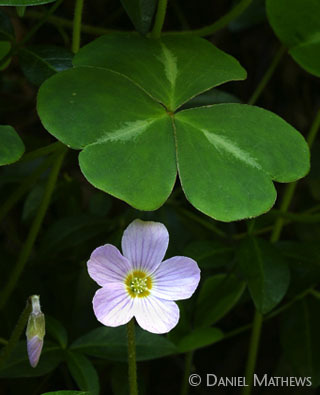 Similar: Great Wood-sorrel, Oxalis trilliifolia, with smaller, nodding flowers in a whorl atop a tall stem, is usually near a creek. Suksdorf Wood-sorrel, O. suksdorfii, has yellow flowers. All three grow in the Gorge, but O. oregana is by far the most abundant. Natural History: Herbs of deep shade habitats typically hold their leaves horizontal to maximize the amount sunlight of sunlight that hits them. Wood-sorrel does this, but at times creases them sharply downward (lower photo), taking about six minutes to fold up and thirty minutes to flatten them again later. It responds this way to a puzzling variety of stimuli. When a patch of sunlight comes along, folding up conserves moisture and avoids sunscorch. At night the reason may be similar: there is no photosynthesis to be lost by closing up shop, and there is at least a small amount of evaporation to be curtailed. However, folding up in the rain has to have a different reason. It may be to reduce some damage from raindrop impact. 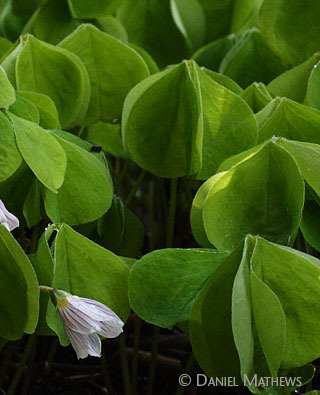 Wood-sorrel makes good mouth-entertainment. Kids all seem to love it. Though unrelated to French garden sorrel, Rumex acetosa, wood-sorrel tastes a lot like it, as well as like Mountain-sorrel (Oxyria digyna, also unrelated). All get their tartness from oxalic acid, which is mildly toxic, so don’t let those kids overdose.